The MA24106A power sensor is a USB power sensor that eliminates the need of a traditional power meter. It is a highly accurate, standalone instrument that communicates with a PC via USB. The power measurement capability of MA24106A is intended to mimic that of a traditional thermal (thermo-electric) power sensor with a wider dynamic range. Therefore, it is ideal for measuring average power of CW, modulated RF waveforms such as 3G, 4G, OFDM, and multi-tone signals. It measures true RMS power regardless of the type of the input signal. The presence of a micro-controller along with signal conditioning circuitry, ADC, and power supply in the sensor makes it a complete miniature power meter. The data display, acquisition occurs in the PC. 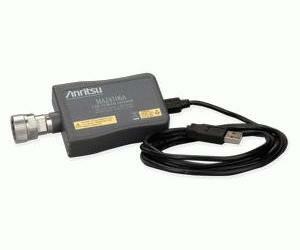 The Anritsu Power Meter application for personal computers running Microsoft Windows™ can be used to control and operate the sensor. It is available standard with the product. The MA24106A is compatible with the MS272xB, MT8222A, MS202xA, MS203xA, and MS271xB instruments.